In these Strawberry Peanut Butter Bites, fresh strawberries are filled with a creamy peanut butter and chocolate mixture, then dipped in melted chocolate for a unique take on chocolate-covered strawberries. The combination of peanut butter and strawberries may sound unusual, but it's a sweet-and-salty flavor mix that works well with rich chocolate! You can substitute any other nut butter for the peanut butter (I think almond or cashew would also taste amazing! ), and consider playing around with the type of chocolate as well. These would be great dipped in white or milk chocolate! Melt 1/4 cup of the chopped chocolate in the microwave, and allow it to cool to room temperature. In a small bowl, combine the melted chocolate and peanut butter, and stir until they are well-mixed. Refrigerate the bowl briefly to thicken the mixture, for about 15 minutes. Slice the washed and dried strawberries in half diagonally beginning at the right of the stem. Using a piping bag or a knife, pipe or spread a thin layer of chocolate-peanut butter mixture on one half of the cut strawberry. Press the other half of the strawberry back on gently, and set the berry on a baking sheet lined with foil or parchment paper. Repeat until all of the berries are filled with chocolate and peanut butter, then chill them in the refrigerator for 15 minutes. Melt the remaining 1 cup of chocolate in the microwave. 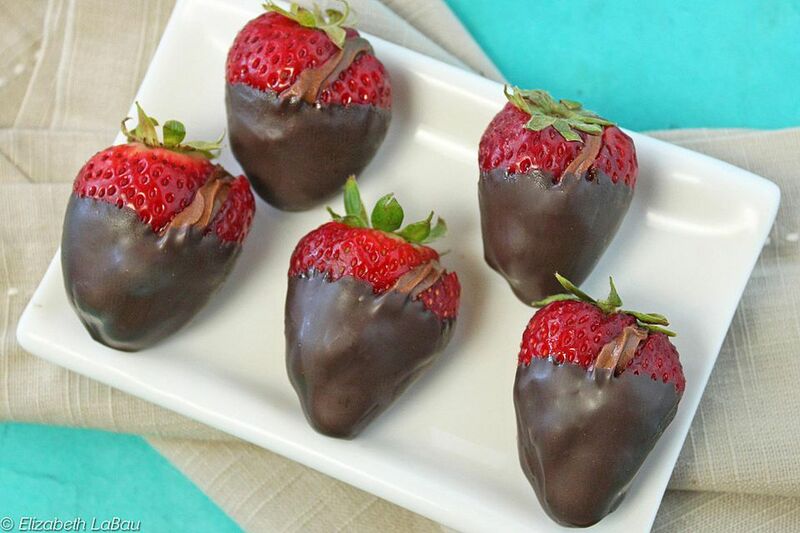 If you are using chocolate chips, you might want to add 1-2 tsp of vegetable shortening to make the chocolate thin enough to effectively dip the strawberries in. Dip the bottom half of the berries in the melted chocolate and place them back on the baking sheet. Refrigerate the tray for 15 minutes, or until the chocolate is set. Keep the berries chilled until you are ready to serve them. Strawberry Peanut Butter Bites are best enjoyed within a few hours of making them. Click Here to View All Strawberry Candy Recipes!